Artists going solo are always haunted by the specter of their main gig. 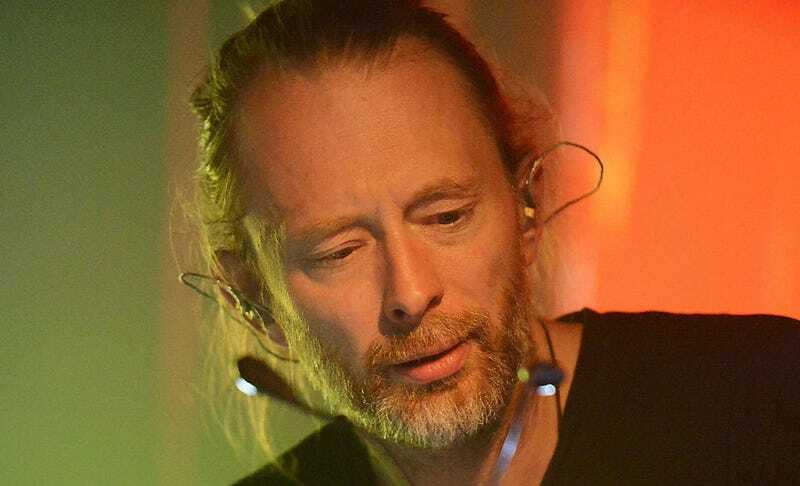 Thom Yorke’s pair of electronic releases under his own name, from 2006 and 2014, were little exercises in laptop craft, featuring typically baleful melodies and wry, aphoristic lyrics. In 2013 he released a one-off album with his supergroup touring band, Atoms For Peace, that similarly felt like a productive jam session caught to tape, interesting mostly for the way it reflected his higher-profile work with Radiohead. These records always seem to demand the rest of his band: the Greenwood brothers’ gift for texture, Phil Selway’s kinetic drums, the group’s shared inability to dial it down, even a little bit, even when writing a concept album about a tree. But Suspiria, Yorke’s soundtrack to Luca Guadagnino’s remake of the classic 1977 giallo, rebuts this argument. It’s big and gaudy and abrasive; it’s lushly textured and symphonic; it’s Yorke’s best solo album, assuming you are into the idea of 80 minutes of Amnesiac B-sides and analog dark ambient. He sounds challenged, out of his element, like he’s trying. In a quote destined to be reprinted in every review of this record, Yorke discussed the ability of repetition in music to hypnotize the listener, saying, “I kept thinking to myself that it’s a form of making spells. So when I was working in my studio I was making spells.” The film’s themes and aesthetic are the animating force here, rather than the anxieties he’s been exorcising on record for a quarter century. This results in work that can be as rhythmic as anything he’s released since In Rainbows, although largely via loping, repetitive synthesizer figures, each slowly etching out some incantatory figure. The music radiates malevolence—the second song is called “The Hooks” and features wet splats and grunting noises—but also a dark warmth, as on the aquatic ballad “Unmade.” Despite occasionally fomenting into recognizable song-like structures—please note the guitars of “Open Again” and the Krautrock boom-bap of “Has Ended”—the album is decidedly ambient, a sinuous, 80-minute sea of sound, operating via its own dictates. Even after the supposed “Finale” the record stretches on for another 20 minutes of windswept moans, twitching into new forms unexpectedly, like a spirit in search of a body. Certain pieces here seem unfinished, or begging accompaniment, but this is true of any film’s score—even Goblin’s all-time-great soundtrack for the original Suspiria. The Italian prog band sound positively possessed on that record, shredding on little-used instruments like the Greek bouzouki and the Indian tabla, but the music there served a much different purpose than it does in Guadagnino’s film. For Argento, the music was evil; it pushed aside curtains, set dogs howling, manifested the witchcraft the viewer suspected to be lurking in the ballet school. In the new movie, though, there is no question about what’s going on—witchcraft happens openly, on camera, and early—and so the music is free to work at a more subconscious level. In context, Yorke’s score is frequently buried beneath the other noises of the mix: endless whispers, sighs, moans, mountainous shrieks, riots. Isolated into album form, then, we hear just what had been lying underneath—wheezing harmoniums, fractured synthesizers, gloaming feedback—even though these elements still seem extracted from some larger whole. Who cares, though? Part of the fun of a film score is the way it suggests the larger work. Yorke’s work is destined to be compared to bandmate Jonny Greenwood’s score for Paul Thomas Anderson, and, indeed, it turns out that both members of our most IMAX-scale rock band have similar approaches to film-scoring, full of swooning strings and uneasy anachronism. For a first foray, though, Yorke couldn’t have picked a better movie. Guadagnino’s Suspiria is seriously invested in the abstract power of music, separating its acts with keyboard graphics that gradually stretch across the screen. In its opening scene, an extremely distressed Chloë Grace Moretz laments “an evil song stuck in (her) head,” which we never quite hear but feel throughout the film. Its ballet scenes are climactic, cathartic centerpieces, dramatically illustrating the power of sound to move, to manipulate, to conjure. Yorke’s score is a shrine to that dark power.